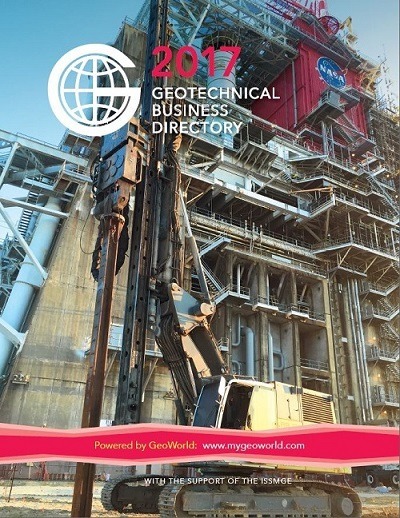 The 2017 Geotechnical Business Directory is published for the third year after the successful publication of the 2015 and 2016 directory! The 2017 directory has grown significantly since last year and includes 7000+ members, and 500+ geo-companies and geo–organizations from a total of 143 countries. It is expected to reach 50,000+ professionals. The online platform of the directory allows visitors to search for professionals or companies based on location, experience, expertise, industry and other parameters. The Geotechnical Business Directory is continuously updated. The e-book and in-print version is going to be circulated annually. Preparations are already ongoing for the publication of the 2018 Business Directory that is expected to include 8000+ individuals and 600+ companies in the geo-profession, and have increased functionalities.